WHO says Adam Scott can’t putt – he has just holed a 50 footer on the third playoff hole to win the Byron Nelson Championship US PGA Tour event in Texas. Scott was questioned about his putting before leaving for the US to contest the Masters and join the tour and said he didn’t believe it was a nemesis. 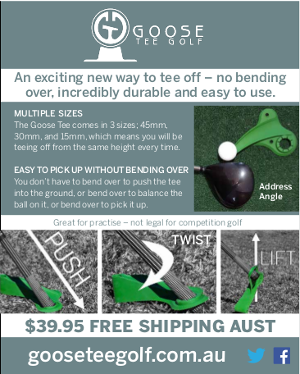 The Queensland golfer said he had been using the one putter for two years and didn’t feel a need to find a new stroke. “Unlike a lot of guys, I only have six putters in my collection,” he reportedly told an interviewer from Pacific Golfer. Scott rejected suggestions from some quarters that his putting was the reason he had never won a Major, pointing out he finished 30th in the putting on the US Tour last year. Coming into the final round of the $6.83 million Byron Nelson in Dallas, Scott had a three stroke lead but struggled early and frittered it away. He faced defeat when he trailed American Ryan Moore with one hole left in regulation, but made a three metre birdie putt to force a play off. Failing take advantage in the first two playoff holes, Scott then faced his monster put. Reportedly, it was almost 16 metres, up over a ridge and downhill to the hole with a couple of metres of break on the way. When the ball dropped into the back of the cup, Scott had secured his 14th professional victory and sixth on the US PGA Tour, though not quite the way he had planned to finish. That particular putter, you would think, is staying in the collection. They’re still at it. An AAP story originating from Charlotte, North Carolina talks about his 50 foot “bomb” and says Scott does fine with long range putts. It’s the short range putts that are a problem. “He can hole putts from long and medium range, but get him just a long step from the hole and his confidence seems to drain away.” the story says. “Scott, 27, ranks 189th (nearly last) in putts from inside 1.5m on the US PGA Tour this year. From mid-range, however, he is outstanding, ranking first from 3 to 4.6m. He makes a brilliant 50 per cent of putts in that range. I think may golfers will know how that feels. Now Adam Scott is No 3 in the world behind Tiger Woods and Crazy Phil Mickelson – I wish I could putt that bad! The third round of the Players Championship at the Sawgrass TPC and Adam Scott’s putting desterted him. According to AAP, the Queenslander made a fabulous start with four birdies in the first six holes, but a bogey at the par-three eighth, where he missed a short putt from barely one metre, drained his fragile confidence on the greens. “Everything was looking good and then I missed a short one on eight, a 10-footer on nine, a short one on 12 and a short one on 16,” Scott lamented.